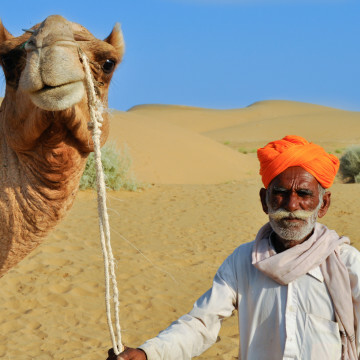 One cannot leave the state of Rajasthan without experiencing a camel safari in the desert. Jaisalmer, the golden city located in western Rajasthan, is an ideal place to experience a camel safari. Nearly half of Rajasthan is a desolate desert, receiving very little rainfall. On the western edge of Rajasthan, just 100kms from shared border with Pakistan, is the city of Jaisalmer. Jaisalmer came to prominence because of its strategic location along an ancient trade route linking India to Central Asia, Egypt, Arabia, Persia, Africa and the West. Traders would use camel caravans to cross the inhospitable desert. Those glory days when rich traders built elaborate havelis slowly declined over time as Jaisalmer lost its strategic advantage with the rise in popularity of the sea route. On this half day tour we take you on a desert experience that includes visits to historical monuments, a haunted village and a desert village. The highlight is undoubtedly the camel ride, which will end in the sand dunes. We will leave Jaisalmer town around 1.30 PM on a jeep to start the camel safari. En route, we will visit Barabagh, Kumbalgarh and a small Rajasthani village. We will begin the camel safari, with each person on one camel, riding single file. After about 1.5 hours, we will arrive at the sand dunes. You have access to snacks and water. The sunset over the sand dunes is a magical experience – make sure you get a few memorable pictures before it becomes dark. Post sunset, we return to Jaisalmer town on safari jeeps.